Gay rights activist and MSNBC anchor Contessa Brewer continued to insert her politics into news reports on Wednesday. The News Live host discussed changes in how the Mormons view homosexuality and lectured, "And we hope to see more progress from the Church of Latter-Day Saints in the future." The Mormon Church has announced it will no longer require those who have homosexual attractions to seek counseling, but still opposes acting on such feelings. That, apparently, wasn't enough for Brewer who complained to Fred Sainz of the Human Rights Campaign, "So, there's some progress there, but, yet, the church still calls homosexuality a violation of God's commandment." Video follows after page break. ABC's "The View" hosted pastor Joel Osteen Tuesday, author of the book The Christmas Spirit – but the conversation took a controversial turn and went from Christmas to homosexuality. Co-host Joy Behar belittled Osteen about his conservative Christian beliefs on the matter. ABC's Barbara Walters first popped the question in the middle of the interview, flagging it was a "controversial" topic. She referenced a previous quote made by Osteen on the show about homosexuality not being "God's best" for a person's life. Walters asked him how he felt about a Georgia pastor who recently came out and said he was gay. After Osteen's tepid response, Behar interrupted him and flatly lectured him that homosexuality is natural. "It's not a choice, Pastor," she asserted. "It's not a choice, and therefore I don't think that God would look askance at homosexuality in that way, because it's not a choice. They're born this way, people are born this way." The archbishop's two brothers will be there. So will a rabbi he knows from Pittsburgh, the D.C. barber who cuts his hair and the fast-talking (and devoutly Catholic) television commentator Chris Matthews. Do "devout" Catholics lecture their bishops that they should get their churchy noses out of our legislating? Boorstein apparently missed Matthews lecturing the Bishop of Providence, Thomas Tobin, in defense of Rep. Patrick Kennedy's pro-abortion politics on "Hardball" last November. On Sunday night's All Things Considered newscast, NPR anchor Guy Raz celebrated “Protestant royalty” coming out of the closet. Bishop Jim Swilley of a megachurch appropriately called The Church in the Now decided to reveal his sexual orientation because of the burst of gay-bullying publicity. Former CNN reporter Raz welcomed the change and how it must have been “incredibly liberating” to be openly gay. RAZ: You come from a long and distinguished line of famous southern preachers. One of your kids said “Protestant royalty,” that's where you come from. Did you feel like - when you were growing up, did you feel like you were a sinner most of your life? I mean, as a kid, when you had certain thoughts, did you feel like, you know, this isn't what you were being taught? On Friday evening, ABC’s World News and the NBC Nightly News both informed viewers that Cindy McCain - wife of Senator John McCain - supports repealing the Don’t Ask Don’t Tell policy on gays in the military. NBC’s Chuck Todd merely mentioned her disagreement with her husband on the issue while noting that Senator McCain "is the guy holding up" any change in the law. But ABC went further in showing a clip of Cindy McCain from a Web ad asserting that homosexuals in America are treated "like second-class citizens." Anchor Diane Sawyer introduced the clip: "And someone we haven’t heard from in a while, Cindy McCain, wife of Senator John McCain, speaking out, disagreeing with her husband who opposes a repeal of Don’t Ask Don’t Tell. She condemned the government policy that prevents gays from serving openly in the military." Then came a clip of Cindy McCain: "Our government treats the LGBT community like second-class citizens." The November 9 episode of Glee titled “Never Been Kissed” was quite the show stopper – unless you’re the media. The unexpected homosexual kiss between male high school students was nothing short of jaw-dropping, and yet the liberal media were “ho hum” on the controversy. Glee’s stereotypical jock character Karofsky, who has been bullying the openly gay character Kurt all season, in a moment of passion, planted a kiss on Kurt in last night’s episode. Kurt, played by actor Chris Colfer has been heralded as nothing short of a superhero for his sensitive portrayal of the difficult high school experience of gay high school students. As [the Pope] headed to the basilica, about 200 gays and lesbians staged a 'kiss-in' to protest his visit and church policies that consider homosexual acts 'intrinsically disordered.' Later, a few hundred women marched to protest their second-class status in the church and the Vatican's opposition to birth control. First: Winfield tells us that "some 250,000" supporters attended the dedication. If there were 200 gay demonstrators, that would represent 0.08% (or 8/10,000ths) of all who were in attendance. At most, this minuscule "kiss-in" merits a passing mention. Yet with the article's headline, "Pope defends family as Spanish gays hold 'kiss-in'," the AP practically gives the gays equal billing. Zuker, whose Twitter profile states he is a “TV writer/producer” who is “currently working on ABC's “Modern Family,” frequently tweets about the show, its characters, and the actors on the show. Odd, that a very politically intolerant tweet would appear from a writer of an extremely tolerant, progressive, sitcom. Vanity Fair’s attacked conservative men with its latest political satire: a soft-core pornographic, borderline homosexual and obviously photoshopped “Official 2010-2011 Republican Beefcake Calendar.” Humorous perhaps, but also an attack on those candidates and certainly not the magazine’sfirst jab at Republicans and conservatives. In an effort to possibly shift “GOP tidal-wave” dialogue or to simply make depressed Democrats laugh, Vanity Fair has showcased a racy, crotch-shot-laden calendar of headline-making GOP men just one week prior to the important 2010 midterm elections. While only a few of the photographs actually improve the image of the Republican men, by making them look extremely masculine with rippling muscles, most of the photos mock the men by photo-shopping their heads onto men in arguably “gay” poses. 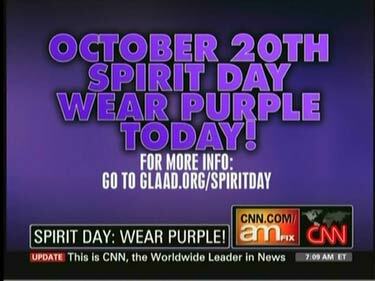 CNN continued its promotion of the left-wing agenda of homosexual activist groups by devoting five segments on Wednesday to promoting GLAAD's "Spirit Day" or "Wear Purple Day." The network promoted the organization's website for the special day, which, as anchor John Roberts described it, was organized "to show support for gay and lesbian youth and honor teens who have taken their lives in recent weeks." Roberts highlighted "Spirit Day" during a brief eight minutes into the 7 pm Eastern hour of American Morning: "Well, if you're logging on this morning, noticing a lot of purple people on Facebook this morning, that's because today has been dubbed 'Spirit Day.' The Gay and Lesbian Alliance against Defamation is asking everyone to wear purple and turn their Facebook and Twitter profiles to purple to show support for gay and lesbian youth and honor teens who have taken their lives in recent weeks. For more information, you can visit glaad.org/spirit day." During the brief, a special purple graphic was displayed on screen. Whether its laziness or the intentional furthering of a leftwing agenda, the facts remain: The media continue to promulgate the link between gay teen bullying and suicide among teens, failing to highlight other leading causes. Forbes.com reported that on October 19, Facebook announced it has joined with MTV and the Gay and Lesbian Alliance Against Defamation in a “Network of Support” to combat gay cyber-bulling. This comes after more than three weeks of nation-wide stories highlighting the death of Tyler Clementi, a Rutgers student who took his own life after learning his sexual encounter with another male was broadcast over the internet.